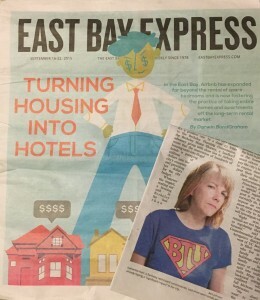 UC Berkeley’s alumni magazine covered the student housing crisis – but failed to note that it’s folks renting out housing on Airbnb that is taking away permanent homes and contributing to making housing more expensive for all! Berkeley’s Short Term Rentals law is expected to be discussed at the planning commission on November 4. BTU has endorsed San Francisco’s Prop F. We hope our City makes a law that can, and will, be enforced – so we don’t have to do a ballot measure here! Berkeley Seismic Retrofits: Cup Half Full? San Francisco plans to allow rent increases to pay for retrofits. So far, Berkeley hasn’t done that. Los Angeles plans to require retrofit of concrete buildings as well as soft story ones – Berkeley hasn’t done that either.